Zelda often stands by Curly when she sleeps. Curly is an excellent sleeper and someone has to watch out for danger. Even before the move, the friendship between the horses was obvious. They look out for each other. They stand guard when their friend sleeps. And they worry when they are gone. For the two weeks that Curly and Zelda were at the “old barn” alone, they stayed very close to each other. Although Curly didn’t get upset when I took Zelda off to hunt, she was always very happy when I brought her back. She’d start whinnying when she heard the trailer pull down the driveway and would race over to greet Zel. In their new space, they are vigilant. Freedom in particular is keeping watch over his herd and it’s going to take some time to get them all to relax. At the old barn I’d put Freedom in a back paddock when I took Zelda out to ride. He felt comfortable there and would snooze and eat hay without getting upset. Now, he’s worried. What if one of his friends leaves and doesn’t come back? This morning Willow’s owner came to ride her and found that she and Freedom both got frantic. They called to each other continuously and Freedom showed off his amazing speed by running laps in the pasture. Needless to say, it was not a fun ride. Funny thing is, Freedom is fine with leaving the herd — he just doesn’t like to be left. This afternoon I took Zelda out for a ride. Freedom wasn’t quite as frantic, but there was a lot of “communicating” as we rode off. Freedom ran around a bit but either he doesn’t care that much if Zelda leaves or he was just plain tired. He quit running pretty quickly. Zelda was good about going off on her own. We had only a few stubborn moments, none of which were punctuated with bucks. The way home got a bit dicey as she knew exactly when we got within ear shot and immediately announced that she was almost back. It’s hard to describe the feeling that goes through her body when she’s thinking of running home. It’s a gathering, a collecting, an anticipation of speed, power and willfulness. I dismounted and walked the last bit on foot! For the most part, the horses have really settled in well but I’ll be glad when they start to feel at home. Friendship between horses is a beautiful thing. 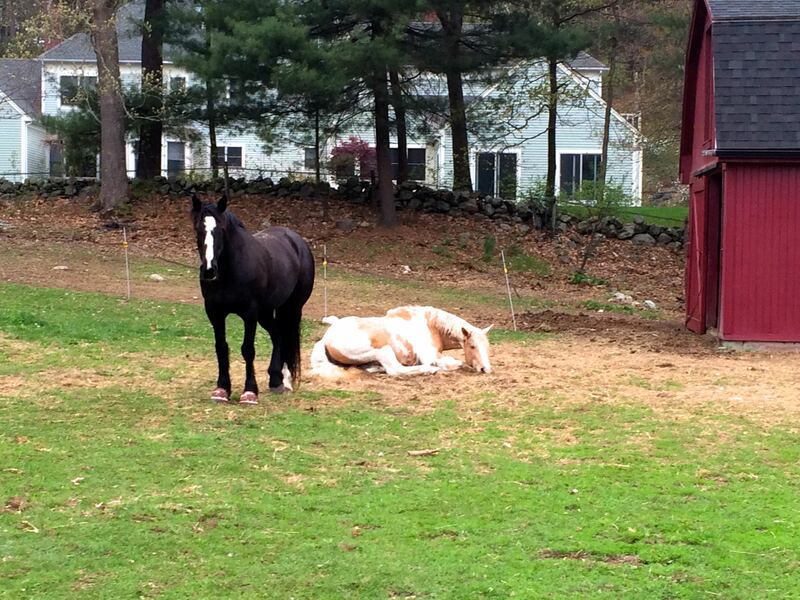 I don’t have the feeling that my horse has a special friend at the barn and that sometimes makes me a bit sad. The woman who owned Zelda before I did told me that she’d never cared much for any of the other horses she’d been turned out with. It makes me happy to see her with Curly because they often groom each other! I would have gotten off and walked too. Whinnying is alarming because it’s sooo loud (when you’re close to it). It goes through you.